JohnElkinton.com - publications - reports. Reflections on a pilgrimage to childhood haunts in a troubled island. They say you can't return to your childhood, but ever since that day in 1959 when my family and I took ship for Italy, I have ached to return to Cyprus. As the great ship turned out to sea and the Famagusta docks and fortifications shrank into the eastern horizon, I stood at the warm, salty metal rail, nine years old, feeling like some sort of refugee. It would be forty-six years before I once again set foot on Cypriot soil, or - as it turned out - tarmac. And by the time I did the island had been torn in half for over a generation. What follows is the story of a few short days in late March, 2005, when Elaine and I embarked on our second ACE study tour (www.study-tours.org). 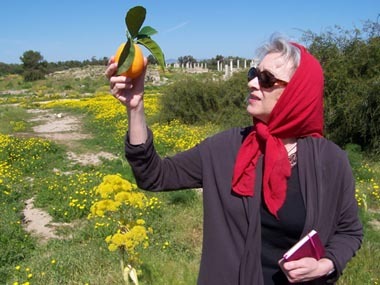 The first, to Syria, had been such an outstanding success that some part of me dreaded tempting fate again, particularly where it involved a return to Cyprus, which - alongside the years we spent on a farm outside Limavady, Northern Ireland - had so powerfully shaped my consciousness and interests. In the event, we both returned agreeing that the trip had exceeded our wildest expectations. In part, perhaps, that's because our expectations were low. Ever since the mass graves and other atrocities of the 1970s, peaking during the 1974 Turkish invasion of northern Cyprus, I had pretty much given up any thought of returning - given that most of the places I wanted to see were north of the bitterly disputed Green (or Attila) Line that now separated the Greek south from the Turkish north. It was only when the Turkish Cypriots finally voted for membership of the European Union, only to have the Greek Cypriots vote to keep them out, that I began to think in terms of a possible return. After checking with colleagues at Amnesty International, to see whether there were still reasons to stay away, we decided to give it a go. Booking late, we were lucky to get a couple of cancellations. Elaine writes: Cyprus wasn't a No. 1 choice for be, but John had wanted to revisit his childhood haunts ever since I met him. When I saw Northern Cyprus scheduled for March in the ACE catalogue, I thought this was the time. The tour leader, too, sounded interesting, as the curator of the RIBA collection of the prints and drawings at the V&A Museum. When I managed to book the last two places, I was cautiously optimistic. John was thrilled. After the chaos of the Turkish Airlines section of Heathrow's Terminal 3, where we found that one member of the study tour was an old friend, it was almost a relief to get on the flight to Izmir. After an hour's stopover at Izmir, we were off again to Ercan airport in Cyprus, arriving well after midnight, local time. The air was pleasantly chill as we disembarked from the jet and walked across the tarmac to the terminal, but the faint, mimosa-like fragrance was utterly delightful, seductive. As our bus headed westward across the plain towards Nicosia, then turned right and north for Kyrenia (the Turks call it Girne), we were welcomed by the bearded course director, Charles Hind, and his bearded local colleague, Senol Ciner. Inevitably, it proved that they had other qualities, too. 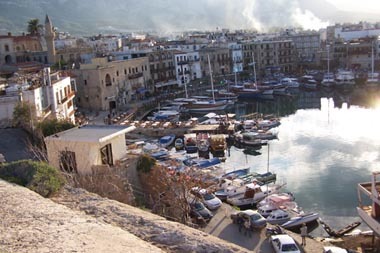 I was slightly taken aback, however, by how quickly we got to the coast and how low the Kyrenia range seemed to be. Then it struck me that the roads must have been straightened considerably since the 1950s and that - in the dark - the peaks were looming on either side of the pass. 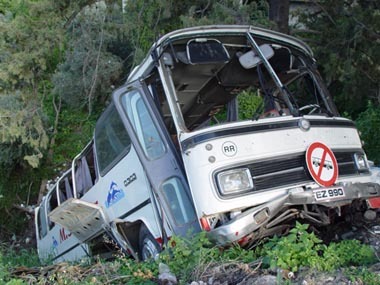 Getting into Kyrenia proved a bit of a trial with the bus having to negotiate some particularly tight corners, waltzing around a number of roadworks. 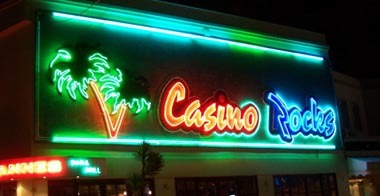 And the initial impression of the neon-lit casinos as we headed for the Dome Hotel seemed to confirm my worst fears. But we were too tired to fret, picked up the keys to our room, 404, overlooking the sea as it turned out, and headed off to bed. Elaine writes: Room 404. If I were to fall out of the window, it would be straight into the sea. But instead I fall into bed and am asleep as soon as my head touches the pillow. We awoke to wonderful blue skies, with nothing slated until 12.00, when we all headed off for Bellapais Abbey. 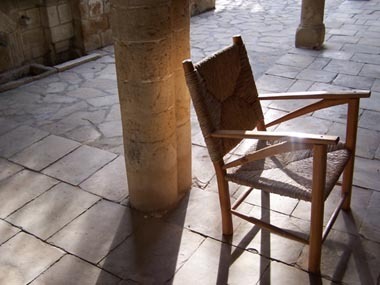 Having recently re-read Lawrence Durrell's Bitter Lemons, I was intrigued to see the competing candidates for his 'Tree of Idleness', including a mulberry tree and a Japanese pagoda tree, under which a seemingly unending game of backgammon was played in Durrell's time. We wandered around the Abbey, from which I spotted a scarecrow in the gardens way below, dressed - it seemed - like an archbishop, complete with mitre. It (or more likely hunting pressure) seems to have been remarkably effective: one of the things that struck a number of us was the paucity of birdlife on the island, coupled with the crunch of blue or red plastic shotgun cartridges underfoot in the wilder areas. We did see a fair few sparrows and hooded crows, however, plus the occasional falcon, duck and lark. Lunch at the Huzur Agac restaurant, overlooking the Abbey. The first of many meze meals, which I like tremendously, but this time with a tank of beady-eyed piranha overlooking my back throughout the proceedings. They seemed to be aggressive kissers: most had seriously gnawed mouthparts. As we walked back to our bus, a number of us took a closer look at a listing monument, a coach that was suspended at the top of a long slope down to a rubbish drop in the centre of the village. Given how much attention we paid to it, I fear it could become a listed monument. Later in the day, we wandered around Kyrenia castle. This was a prison for EOKA terrorists (or freedom-fighters, depending on your view) when we were there in the 1950s, so inaccessible. I loved St George's, the encapsulated Byzantine church thought to date from the 1100s, once outside the walls but absorbed into the much more powerful structure of the Venetian period. Though some probably loved the display of torture methods, with a Mumluk prisoner standing in for the multitudes abused and slaughtered within these walls, I had taken off on my own along the battlements, drinking in the astounding panoramas and the glorious diversity of wildflowers erupting from between the stonework. I also managed to shoot in to the Shipwreck Museum, which was beautifully presented. 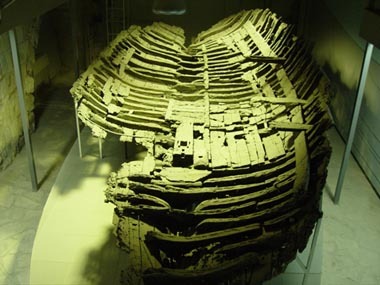 When it sank some 2300 years ago, the wrecked ship had already been 80 years old and much repaired. The cargo was mainly composed of amphorae of wine, with the 4-to-5-man crew apparently subsisting on almonds, together with what fish they could catch along the way. On the subject of fish, the Turkish Cypriot I had sat alongside on the flight from Izmir had warned that much of the fish now eaten on Cyprus comes in from Turkey. He noted that the damming of the Nile at Aswan had stopped the flow of nutrients into the eastern Mediterranean. The result - as I knew from my work in the Nile delta in 1974 - was a collapse of many offshore fisheries, though I had no idea that the impacts had extended as far north as Cyprus. Later still, with the castle about to close, I again prowled the walls with Elaine, Charles (Hind) and several others. We stood on the battlements overlooking the harbour, watching the sun go down behind the mountains, through the smoky haze. A magical moment, though we had earlier walked along the quay and seen the astonishing profusion of plastic bags and beer bottles in the apparently romantic waters below. Elaine writes: At one point in Bellepais, I found myself standing among the ruins and tall cypress trees, listening to the timeless sound of the cicadas. Bees cruised above the swathes of yellow-green Bermuda buttercups, reminding me of the beekeeper we met under the walls of Kyrenia Castle this morning, cleaning out the frames of his beehives. After a visit to part of the Green Line where it cuts through Nicosia, taking a moment to view the bullet holes where soldiers sprayed the top of a tall building to knock out one or more snipers, we are dropped off at the Kyrenia Gate in north Nicosia. Here I easily recognise the ramparts, topped by a long, low building with a pan tile roof, surrounded by tall eucalyptuses. 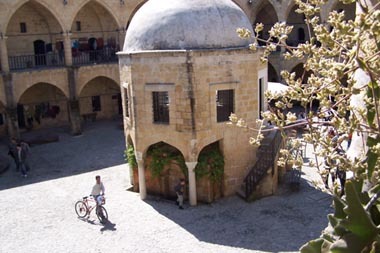 We walk the short distance to the delightful remnants of the Mevlevi Tekke (or 'Whirling Dervish') museum, with its line of 16 tombs under six domes and its blossom-filled courtyard. Lines of elegant tombstones, the style of the carved headdress topping the stones apparently speaking volumes to initiates. The music to which the Dervishes danced included that of the reed flute, with the lonely sound of the reed flute or ney - uprooted from its reed bed - seen as a metaphor (I read in Marc Dubin's excellent Cyprus: The Rough Guide) for the human soul separated from its Godhead, keening for reunion with the Infinite. Scandalous to orthodox Muslims, the order was widely suppressed, though the British allowed it to live in Cyprus, where it lasted until 1954, a couple of years before the Family Elkington arrived on the island. As we walk along, it is hard to miss the head of Ataturk - propped up like something from a Dali/Orwell dystopia - which overlooks Ataturk Meydani, long the central hub of Turkish life in the city. Again, I recognise the law courts, built by the long-ago British. We pause for a moment by the granite column, once topped by a Lion of St Mark, but toppled by the Ottomans in 1570. The British re-erected the column in 1915, though this time topping it out with a globe instead of the Venetian lion. We buy Turkish delight in the covered market, made with 'mastic', which we take to be gum arabic. Then the Buyuk Hamam, once part of a 14th-century church but now the sunken façade of the city's largest public bath, and the Buyuk Han. As we walk towards the Buyuk Han, I turn to Elaine and say that this used to be a prison. Something else from childhood, I suspect. Then we would hear prisoners clattering their plates and cups against the bars of their cells in at least one of the Nicosia prisons, though the Buyuk Han's incarnation as a prison was from an earlier period of British rule, I think. My memory is that the clattering was when executions were due. There would have been much more clattering when the Ottomans broke into the city in 1570, slaughtering many of the Venetian defenders - and sending the heads of the defeated leaders to the defenders of Kyrenia, persuading them to surrender without further ado. We visit Ayia Sofia, begun by French masons accompanying the Crusaders in 1209 (two years, incidentally, after the original Whirling Dervish, Mevlana Celaleddin Rumi, was born in what is now Afghanistan). The cathedral was under construction for 150 years and was still unfinished when the city fell. Long term thinking incarnate. The Ottomans - who had been burning the old, disabled and ugly among the city's inhabitants, the rest sent off into slavery - turned the pulpit and pews into firewood and evicted the dead from their tombs in the cathedral's floors. Because they also whitewashed the interior, it's possible to get a much clearer sense of the Gothic structure than when it was heavily painted. But, with the wall-to-wall prayer carpet cut on the cross, to enable the faithful to pray towards Mecca, there is something weirdly skewed about the place, an effect heightened by the twin 50-metre minarets grafted like SAM-7 batteries atop the building. Among the other places we drop into are the Lapidary Museum and the Dervish Pasha Konak, once the home of the publisher of the island's first Turkish newspaper. This is hard by the Green Line, as is the old Armenian church we visit. This is now a grisly ruin, full of rubbish and graffiti. One graffito is carved into the plaster. Some take it to be an elegantly cut wine bottle, but I rather insensitively point out that it is more likely a hand grenade. The Armenians, once rewarded for siding with the Ottoman invaders, got it wrong in the 1960s - when the Turkish equivalent of EOKA expelled them from the area because they were judged to have aligned with the Greek Cypriots. On our way back, we walk through a desperately poor part of the city. And when we pass a run-down cinema, I ask Senol where I might have seen the film The Vikings in an open cinema. The film haunted me over the years, largely because of the sequence where a man has a hand chopped off and is thrown into a wolf-pit (though this was tame compared to what happened to Marcantonio Bragadino in Famagusta, where we are headed on Thursday). As we drive back towards Kyrenia, Senol points out the open-air cinema and it is exactly as I remember it, though this shrine to the visual arts has long since been deconsecrated. 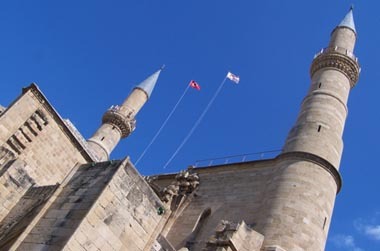 Elaine writes: Once again, we took off our shoes to enter Ayia Sofia, once a cathedral and now a mosque. The blood spilled for this place. The sweat from my stockinged feet forms perfect footprints on the flagstones outside. The essence of my DNA has sunk invisibly into the stones in seconds - and some part of me is there 'forever'. A stunning walk to the top of Buffavento Castle, past the memorial to the crew of a Turkish Airlines aircraft that crashed here in 1988, the year we published The Green Consumer Guide. Again glorious weather, with pairs - always pairs - of quail or black francolin exploding out ahead of us. Their flying habits seem eminently suited to a country carpeted with shotgun cartridge cases. The views are out of this world, back and forth along the coastal strip and, on the inner side of the mountains, across the central plain: called Mesaoria in the South, Mesarya in the North. The last time we were here, we visited the monastery down the hill, where the monks gave my sister Caroline a small glass basket of sugared almonds. The monks left post haste after the 1974 invasion. Despite what happened here to the monks and - much, much worse - to John Visconti, I am having the time of my life. This is the highest of the three mountain castles we will visit, some 3100 feet (945 metres) up. And Visconti? He tried to warn his friend King Peter I of his Queen's infidelities while her husband was abroad. Disbelieved, though it seems that the queen was guilty as charged, the wretched Visconti was imprisoned and tortured in Kyrenia, then bundled off to Buffavento where he was starved to death. I wouldn't mind having some of my ashes scattered up here, though with the winds that buffet these summits in bad weather they probably wouldn't stick around for long. Then on to the nearby Herbarium and a different (I think) abandoned monastery, with upper walkways that are developing nicely as a total hazard to life and limb. Periodic sense as I walk around that my ashes may be blowing in the winds sooner than I had planned, though someone has kindly written in chalk where the hazards are greatest. Elaine writes: The mandrake (Mandragora officinarum) we saw at the abandoned monastery near Buffavento is a weird plant. It has low-lying, blue-grey rosettes of leaves, with heavy, slightly hairy, dowager-blue flowers at the centre. Slightly sinister, it was once considered half-plant, half-human. Once used as a narcotic and anaesthetic, it was used both to treat snake bites and to promote feelings of love, affection and happiness. An early departure eastwards, en route to a rendezvous with a couple of saints, the ruins of Salamis (dating back to the 11th-century BC) and the Venetian fortifications of Famagusta. The high points for me were Salamis, which I don't remember visiting as a child, and Famagusta, though some of the fired clay toys in the museum at the Monastery of Saints Paul and Barnabas were outstanding. The story of the discovery of St Barnabas' body, though, smacks of outright fraud. But perhaps a childhood partly spent sandwiched between Protestants and Catholics (Northern Ireland), Christians and Muslims (Cyprus) and Jews and Muslims (Israel, which we visited from Cyprus) left me with an over-developed scepticism about all faiths? The Salamis visit started with a box of chilled oranges and tangerines from the garden of Senol Ciner, extracted from the hold of the bus. We then found our way around the ruins of the gymnasium, forum and theatre, in the midst of sand dunes and wild fennel 'forests', the latter often covered in small snails that in places had brought entire plants low with their gnawing and combined weight. Much of this city, periodically brought to ruin by earthquakes and sacked by Arab raiders, was until recently under the dunes - indeed, it is thought that a fair amount still is, and some of the ruins also extend out under the sea. 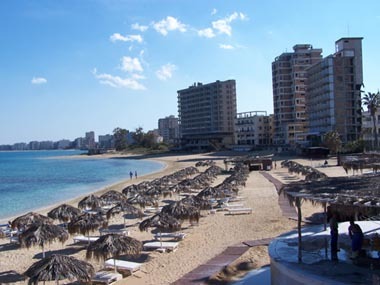 In the end, the inhabitants gave up, moving to Arsinoe, which eventually became Famagusta. After lunch, we walked around Famagusta, starting with the so-called Othello's Tower (originally built in the 12th-century Lusignan period), where I was impressed both by the air vents from the cannon chambers built deep into the walls and by the extraordinary weathering on stones used in the internal walls of the powder room, no doubt because of the recycling of parts of the earlier Lusignan fortifications. Then on to various churches and the Cathedral of St Nicholas (aka the Lala Mustafa Mosque). The latter is quite extraordinary, considered to outshine its Nicosia counterpart, the Ayia Sofia. Unfortunately, the top of the cathedral's two towers were shot away during the siege of 1571, generally considered to be one of the greatest battles of the medieval era. During the 10-month siege - an earlier, larger and more protracted version of the Alamo in 1836 - some 8000 defenders held off around 200000 Ottomans, inflicting an estimated 50000 casualties. By the time the white flag was run up by the survivors, after the long-promised relief fleet from Venice had failed to materialise, the level of bravery had gone off the scale. Then the Ottomans perpetrated another of their grim atrocities, which I recall reading about when very much younger. The surrender had been agreed on terms that meant that the defenders could return to Venice, but the Ottomans soon changed their minds. Tortured for days, Marcantonio Bragadino, the brilliant commander of the defenders, was finally flayed alive between two granite pillars that still stand near the cathedral - and were apparently originally brought across from Salamis. His skin was then stuffed with straw and paraded around the city. Later, it would be ransomed by the man's descendants and is now to be found in a Venetian church. As we head back towards Nicosia and Kyrenia, the sun goes down in a blaze of tangerine and pistachio, the mountains highlighted in all their Gothic splendour. And I think back to when we left in 1959, particularly to the sight of our pale blue Jaguar 2.4, my father's pride and joy, being lifted in a great net into the ship's hold. A small drama compared to what else has happened here, but breath was held. Elaine writes: The central square in Famagusta is pedestrian-only, bar the odd rogue motor-scooter. 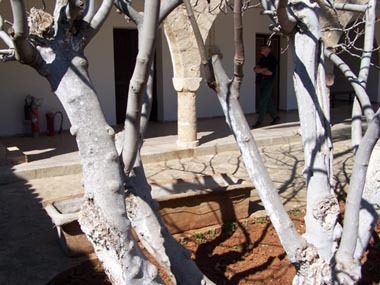 An ancient fig spreads shade outside the mosque. I spotted a yellow-painted postbox with the George VI insignia. Later, John's mother - Pat - tells me that in the 1950s, when the family were here, many of these boxes were painted blue in protest against British rule. The day of days. In all the years I dreamed of coming back to Cyprus, one symbol stood out in my mind, partly I suspect because of the associations with the romantic, brutish Lionheart, Richard of England. 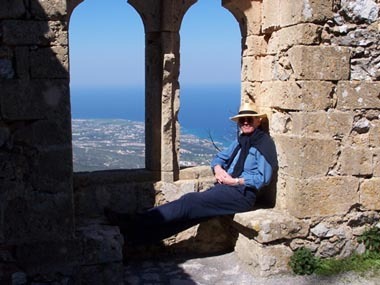 This was the castle of St Hilarion, which we had seen every day when we awoke from the balcony of our hotel in Kyrenia. Even before we got up to the castle, however, we could see the damage done by the fires of 1995. Though the flanks of the mountains are still green at this time of year, most of the wonderful forest cover of the northern side of this part of the Kyrenia range was burned in the three days that the fires raged out of control. Because they started in various places, arson has always been suspected, with Greek Cypriots, Greeks, Israelis and Kurdish separatists among those fingered. It also has to be said that Turkish incompetence and chronic under-funding of the forestry service had a fair amount to do with the eventual scale of the damage, which affected almost 70 square miles. In the event, the castle proved to even more wonderful than I had remembered, not least because you can now get right to the very pinnacles in a way I suspect wasn't possible when I was eight or nine. The one sour note: the jousting ground, once surrounded by trees, is now naked because of the fires and, to add insult to injury, the Turks have slapped a helipad and what looks like an assault course into its very heart. Poetic justice, I'm sure, but tragic nonetheless. Again, the views are unbelievable, under clear blue skies. The fire apparently raged all about in June 1995, destroying anything built of wood and plaster, but you would hardly guess it today. The wildflowers are everywhere, with mandrake particularly in evidence around the walls. On the way back, we pop into the café to get a glass of orange and buy a jar of carob syrup. Homemade by the wife of the café's manager, the orange is delicious - very much like the lemonade my mother, Pat, used to make all those years ago in Nicosia. But it is so cold that, as I hurry to down it in time to catch up with the rest of the group, it almost scorches my throat. In the end, it turns out that I needn't have hurried, since others had tarried a bit lower down - and those that hadn't were busily warning the habitual denizen of the back seat of the bus that his end of the vehicle was cantilevered out over space, rather like the end of The Italian Job. But, as befits a man who had served as a doctor for a community of 600 drug addicts near Hong Kong for something like 30 years, he is unfazed. 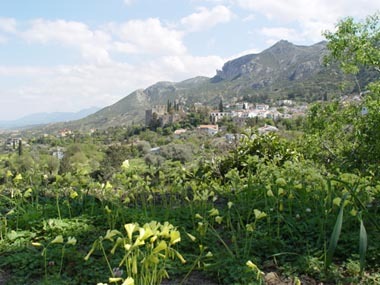 After St Hilarion, we head south towards Nicosia, then turn right, westwards, for the trip to the Monastery of St Mamas and the hilltop palace of Vouni. To get there, though, we have to drive through one of the saddest regions of the entire island. 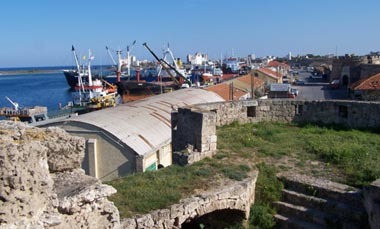 As The Rough Guide notes, if you mention Guzelyurt (known to Greek Cypriots as Morfou) you will trigger grief among Greek Cypriots, who recall that before the 1974 invasion this region was a hub of Greek Cypriot enterprise. The endless citrus orchards, melon patches and strawberry fields are irrigated with water from huge underground aquifers. Unfortunately, the acreage under cultivation has been increased since 1974 and the water resources over-pumped, with the result that saltwater has intruded from the sea, contaminating a considerable area of once fertile land. We take in the slightly grotesque archaeology and wildlife museum, next to the monastery, with its eight-legged lamb (stuffed with the same lack of art that was true, I suspect, of poor Bragadino) and a variety of birds, reptiles and so on that have been around so long that they would have mummified even if they hadn't been so artlessly preserved. But I do get a close look at a bee-eater, which is enough to confirm that it had indeed been a flight of these glorious birds that I had started in the cliffside ruins of Dura Europas, Syria, and then watched wing their way down over the green Euphrates. When we get to the monastery church, there is the usual display of models of different parts of the human anatomy that the relevant saint is supposed to treat, even cure. Senol manages to knock a heap of the things over, with the most enormous clatter, though I doubt that the effects will have been felt in ears and limbs across the region. And even if they were, the monastery contains a rather unpleasant looking 'sweating stone' that exudes what looks like the sludge left after carob syrup is made, which is apparently very effective in such cases. Given that SustainAbility is now working on tax avoidance and evasion by companies, I am particularly interested in St Mamas. A poor, 12th-century hermit, he reputedly refused to pay his equivalent of the poll tax. Soldiers were sent to bring him in for punishment, but as they were trundling along they saw a lamb threatened by a lion (never actually known to inhabit these parts, but let it lie). St Mamas saved the lamb and rode the wild lion into Nicosia. So impressed were the Byzantine authorities that it is said that they forgave him his taxes. There are now 14 churches across Cyprus dedicated to the memory of the patron saint of tax avoiders. 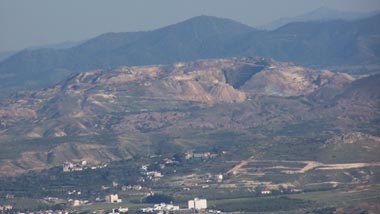 Then onwards again, with the snow-capped Troodos mountains looming to the southwest, into copper-mining country. 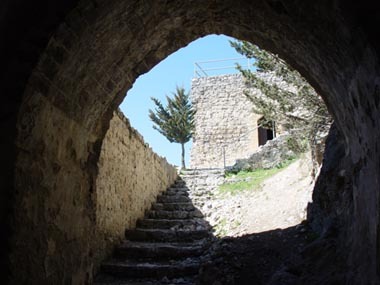 The mines for which Cyprus has been famous for millennia are now pretty much abandoned, partly because of exhaustion but also because of the economic effects of the invasion. As we walk back from the Vouni palace site, I look out across the plain and my eye catches something which literally takes me back almost 50 years. I have always remembered that when we went to Israel we visited a great mining complex, maybe even the source of the legend of King Solomon's mines. But as I see the vast toroidal - donut shaped - hill, I know in an instant that this is where I saw the mining. Maybe someone mentioned King Solomon at the time? The shape is exactly as I remembered it. And later in the day Charles lends me Colin Thubron's Journey into Cyprus, flagging the extraordinary account of the mining here. The mining of recent times, with dynamite and bulldozers, often cut through the galleries dug by generations of earlier miners, many of them slaves. Underground, this area is shot through with tunnels like some giant termite's nest. Elaine writes: A rather alarming Wednesday night. On the way to bed, I found my wrist throbbing violently. It was inflamed and swollen. Doesn't it always happen? Last time, in Syria, the key day was the visit to Krak des Chevaliers, but the day before I fell ill and couldn't travel. In fact, I was amouse squeak from being taken to hospital. In the event, we got to see Krak on our own, but for a while John was desolate, given that this was the main reason he had wanted to visit Syria all those years. Now, with Thursday promising a visit to St Hilarion, the symbol of his years here, I was about to succumb again. But, luckily, had brought my splinter tweezers and managed to 'operate'. By Thursday morning, the wrist was well on its way to healing. Another long haul trip, up into the island's eastward-pointing Panhandle. Having been in Kantara House at school in Nicosia, this was another must, and once again exceeds my expectations. The road up to the castle is endlessly serpentine and I often wonder whether the bus will make it at all. We pass a fair few summer villas that are boarded up, but which in the event of any peace settlement will no doubt be the subject of energetic court cases by the dispossessed Greek owners. 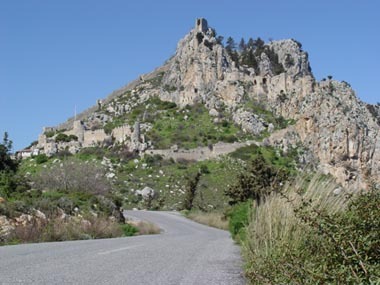 Kantara is a hugely powerful castle, with the best-preserved remains of the three mountain castles we have seen. From the heights, you command huge sweeps of the northern coastline, Panhandle to the east and Famagusta Bay to the south. 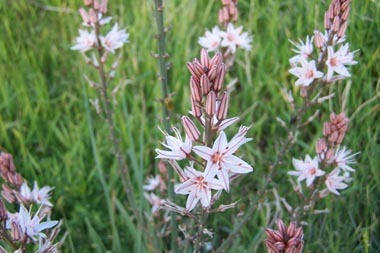 The flanks of the mountain are a riot of cyclamen, giant fennel and other plants unknown to me. On the way down, we stop under trees for an impromptu snack, which includes sheep cheese and beer, wine and raki, made by a distillery near Famagusta, which I am surprised to find myself hugely enjoying. Something I wish I could have caught on film (or disk) was the village where the Greeks and Turks still live fairly amicably alongside each other. What caught my eye as we drove through was that the cafés along the main road linked the Coca-Cola and Pepsi signs. Elsewhere on the island, the war continues, with Pepsi seeming to dominate the north, though I had noticed a few more Cole signs as we had neared the Panhandle. Among several other things we do during the rest of the day, what stands out in my mind is the visit to Ayios Philon, part of the ancient coastal city of Karpasia. 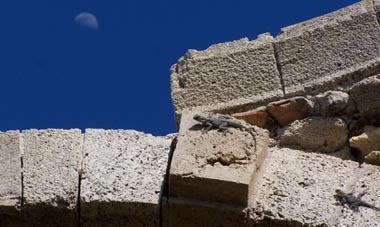 The arms of the long-since destroyed harbour are engaging enough, apart from the endemic plastic flotsam and jetsam, but as the larks trill overhead I spot two large lizards on an arch of the ruined basilica, with the Moon hovering in the background. Spring into action with new digital camera we bought for Elaine at Heathrow but which to date I am the only one to use, largely because I forgot the cable for my Sony CyberShot, with the result that I am limited to the capacity of the two memory sticks I happened to have brought along. 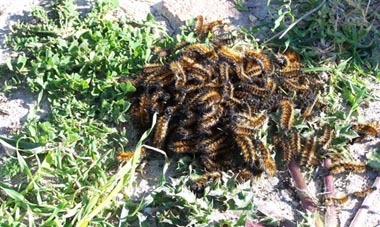 Then, just outside the basilica, I come across several seething clusters of the caterpillars I remember so well from the 1950s. There is an instant, powerful sense of the endless cycles of life and death, of civilisation and decline into barbarism. 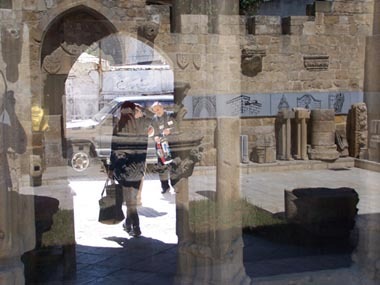 Cyprus, positioned in the path of so many marauding, crusading and empire-building peoples has been subject to intense pressures, but once again friction has resulted in architectural and cultural pearls among the devastation. Our own stay on the island was part of the wind-down of the British Empire. Waning days. There will be other Empires, some imposed, some largely embraced. And Cyprus will continue to be at the epicentre of the endless succession of geological, climatic, cultural, ethnic and political tectonic forces that have shaped and reshaped the region and the island. But, whether you see it in a seething heap of caterpillars or in the boat-builders working on new vessels just over the ramparts from a 2300-year-old wreck, this island leaves you with a sense of the ways in which the human spirit - in all its infinite and troublesome variety - can prevail. As it winds down, I reflect that the trip was far better than I had any reason to expect or hope. And I'm happy to have seen northern Cyprus again, warts and all, before the forces of development really get to work on it. Even today, it is clear that the island's economy is completely unsustainable. When we were returning from the Panhandle, we saw the deflated hulk of the giant red membrane in which fresh water was towed in from Turkey. How long before the endless buildings mushrooming up across the island are the deserted ruins of the future? Like several others I have travelled with in recent days, I come away with a heightened sense not only of the vulnerability of all civilisations, but also of how difficult it is going to be to sort out Cyprus politically and of how challenging it will be to work out a sustainable relationship between Turkey and the European Union. That, however, is something to think about when I'm back in London. 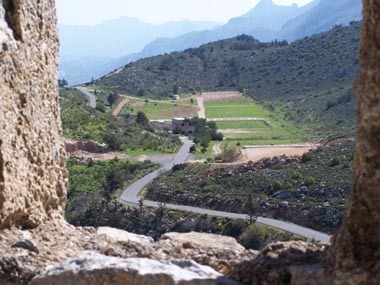 Elaine writes: It's a long trip up to Kantara, with much winding alongside sheer drops. Luckily, I am not on that side of the bus. Instead, I am studying the wildflower book Senol brought for us. To date, we have seen a veritable A-to-Z of flowers, including anemones, asphodels, blue pimpernels, cyclamen, giant fennel, iris, mandrake, narcissi, orchids and poppies, along with a huge number I couldn't identify. Have been pressing some in my notebook. She was martyred on the wheel, recalled in our Catherine's Wheel firework, beheaded, or both. Her story symbolises both the trials and tribulations ahead, and - though St Catherine is now largely passé even in religious circles - the potential of some extraordinary people and peoples to rise above them, the theme of my new book project with Pamela Hartigan on social entrepreneurs. And thoughts of St Catherine also remind me that pretty much top of my list of places to visit next is Alexandria. Elaine writes: I would like to go back one day and see good things happening. But if the embargo does eventually end, it's hard not to fear for the future of the island - given that there would be an even greater boom in casinos, alcohol-fuelled tourism and water-intensive development. I see, though, how this place got into John's soul.